ALL NEW CALENDAR OF 2019 EVENTS COMING SOON! 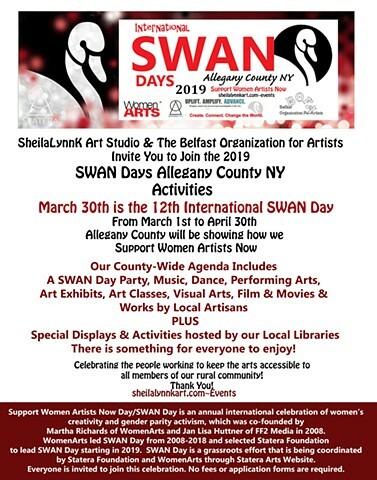 Celebrated locally since 2014 in partnership with Belfast Organization for Artists to shine a light on our local Women Artists as a Creative resource; SWAN Days Allegany County NY has been held in honor of the many creative people working hard to keep the arts accessible to all members of our rural community. Many Thanks to this Year's SWAN Day Planning Team for helping me to get this thing moving! I couldn't do it without you! Patrons make art and projects like these possible! at SheilaLynnK Art Studio you can find out more about that HERE.